In December 2017, the Ayo! team received a text from the mother of 9-year-old Anahit Balabekyan, which said that her daughter had seen Ayo!’s Chocolate Bank project promoted on TV and wanted to help. There was just one problem. 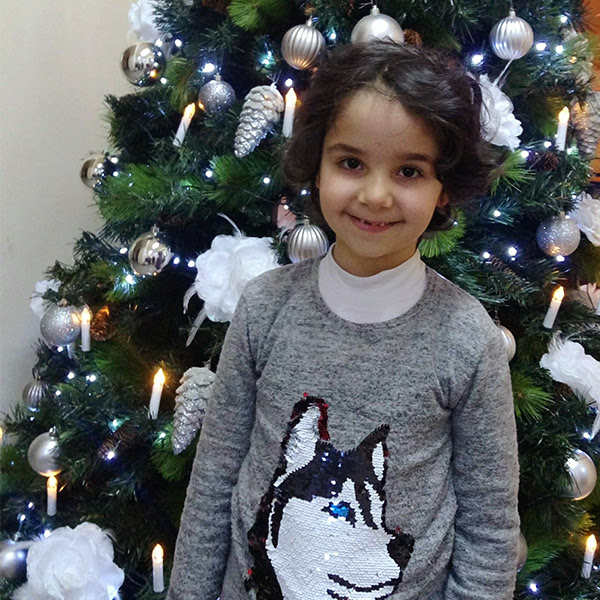 Anahit was unable to bring her donation to the office because she was undergoing chemotherapy at a local hospital for leukemia. Ayo! Community Director Helena Melkonyan immediately went to the hospital herself to take the candy the little girl had collected from her friends for the children of Lori. “I found myself trying to hold back tears when I went to pick up Anahit’s contribution,” recalled Helena. “So many people have helped our family to pay for my treatment, and now I want to help others,” Anahit had told her. Then one beautiful day last month, Anahit came to FAR’s Yerevan office with a box filled with candy to give to kids in the Gegharkunik Province for the 2018 Chocolate Bank … and More project. She had beaten her disease several months before. Her hair has grown back and she still has the same easygoing smile. She is an inspiration. Anahit, along with hundreds of other individuals and dozens of companies and organizations who supported the project, brought smiles to the faces of so many children. You can see more in the photos below. Ayo! is still collecting money to purchase new bedding for local daycare centers to help them get through the winter months. You can help here.